Former Los Angeles Jr. King and NHL draft prospect Dustin Wolf was named CHL Goaltender of the Week for the week ending Jan. 27 after posting a 2-0 record, including a shutout, as a member of the WHL's Everett Silvertips. It marks the second time this season he's received the award. Former Los Angeles Jr. King Dustin Wolf was named Canadian Hockey League (CHL) Goaltender of the Week for the week ending Jan. 27 after posting a 2-0-0-0 record, including a shutout, to go along with a goals-against-average of 0.50 and save percentage of .984 with the Western Hockey League’s (WHL) Everett Silvertips. Wolf becomes the league’s first two-time award recipient of the season after turning aside 61 shots last week for the Silvertips, who maintain their first-place status in the WHL’s U.S. Division with a 35-12-1-1 record. Wolf recorded his league-leading fifth shutout of the season on Friday night with a 36-save performance that earned him First Star honors in a 2-0 win over the Tri-City Americans. 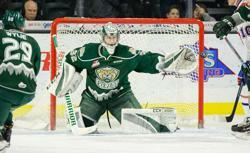 On Saturday night, he stopped 25 shots as part of a 9-1 triumph over the Lethbridge Hurricanes. The 2001-born Wolf was chosen by the Silvertips in the fifth round of the 2016 WHL Bantam Draft. He currently leads the entire CHL with 31 wins carrying a personal record of 31-11-1-0. His goals-against-average of 1.82 and save percentage of .930 are both among the WHL leaders. Earlier this month, NHL Central Scouting recognized Wolf on its midterm rankings of 2019 draft-eligibles; he’s listed No. 17 among North American goaltenders.